As detailed in Parts 1 and 2, New England is facing a current energy crisis. The solution is adding natural gas pipeline capacity to the region as soon as possible, coupled with investments in energy efficiency and renewables. However, the current crisis could get much worse with the anticipated retirement of almost one quarter of the New England’s existing electric generation capacity. The “Hub” is an area of the regional electric grid located western and central Massachusetts framed by major electric infrastructure such as high-voltage transmission lines and substations. Because of this infrastructure, the Hub is an electrically unconstrained area of the grid, meaning that power generated within or delivered to this infrastructure can be reliably dispersed to almost all parts of the New England system under most grid operating conditions. 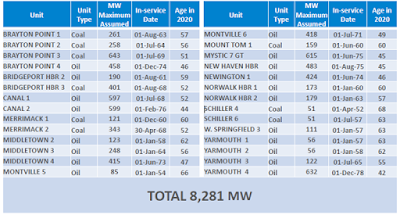 Because generation located at or interconnected with the Hub is in the unconstrained “Rest of Pool” pricing region, cheaper generation located here will have the maximum price-lowering impact for New England. In Scenario 1, ISO found “no more than 950 MW may be retired without causing reliability problems.” This means that despite it being uneconomic and harmful to the environment for old coal- and oil-fired generators to operate, ISO could allow only 950 MW of 8,300 MW to retire. It would be forced to offer above-market “reliability-must-run” contracts the remaining 7,350 MW of capacity to entice its continued operation. In Scenario 2, ISO found that all “at-risk” generation could retire, except 1,350 MW at critical resource sites. System transmission constraints would require “at-risk” resources to remain operational in Connecticut and southeastern Massachusetts. In order to retire 6,950 MW of “at-risk” capacity, however, up to 5,100 MW of replacement resources would be required to be constructed at, or integrated with, the Hub. 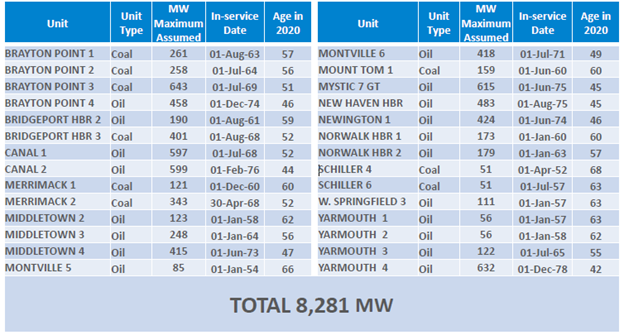 In Scenario 3, ISO found that all “at-risk” generation could reliably retire if 400 MW was repowered in Connecticut, 500 MW was repowered in southeastern Massachusetts, and approximately 5,100 MW of new generation capacity was constructed at, or integrated with, the Hub. As previously discussed in Part 2, generation technologies have different attributes. Coal and oil should be off the table for their cost and environmental impact. Wind and solar are intermittent and cannot provide energy on-demand. Moreover, there is little or no wind potential in central Massachusetts. It is unlikely that nuclear capacity will be constructed in New England in the intermediate future due to fierce opposition. Hydro resources have been declining in New England, as some environmental groups advocate for free-flowing rivers and fight to remove many dams. Moreover, there are no large rivers flowing through central Massachusetts. What’s left? The answer is natural-gas-fired generation, which happens to have the suite of attributes necessary for further integration of intermittent renewable energy. Thus, New England needs to ensure that any new natural-gas fired generation has access the sufficient natural gas pipeline capacity to ramp to full levels when needed. Increasing reliance on wind and solar will magnify the need for increased natural gas pipeline capacity capable of reliably serving existing and new natural gas-fired generation capacity on a no-notice basis. New gas-fired generation will initially serve in a base-load (running most of the time) or intermediate (following predictable demand) role to replace existing coal- and oil-fired units. In the longer term, with increasing renewable penetration, these units, and the natural gas pipeline capacity that serves them, will be needed to serve a ramping and balancing function to smooth out variable wind, solar, and hydro production. What Pipeline Projects are Best-Suited to Supply the Hub, Lower Cost, and Balance Renewables? The Tennessee gas Pipeline Company, L.L.C.’s “Northeast Energy Direct” project is configured in a way that will maximize the ability to, and minimize the cost of, expanding gas-fired generation at and near the Hub and provide the flexible infrastructure in the long-term that will allow such new generation to reliably serve its future ramping and balancing function for renewables. The Northeast Energy Direct project, along with the existing Tennessee Gas Pipeline, would closely track the contours of the Hub, and over 90% of it would be co-located along existing utility corridors (e.g., where electric transmission already exists). However, the convenience of the Northeast Energy Direct for Hub-based generation does not mean other proposed pipelines are not important. 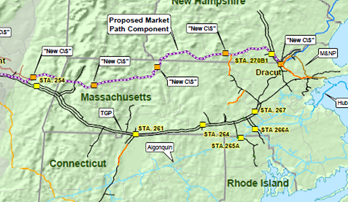 Spectra Energy’s proposed “Access Northeast” project, located in New Jersey, New York, Connecticut, Rhode Island and Southern Massachusetts, is important too because it will help to eliminate New England’s gas pipeline capacity deficiency and serve local distribution gas companies and generators. In a future post, I will detail how much pipeline capacity is needed to substantially reduce or eliminate New England’s pipeline capacity deficit, and thus reduce our electricity and natural gas prices to levels enjoyed everywhere else in the country. To attain the three goals of: (1) reducing energy costs; (2) increasing efficiency and renewables; and (3) eliminating coal- and oil-fired generation, New England desperately needs natural gas pipeline capacity. Natural gas pipeline constraints, not the price of the commodity, are imposing a multi-billion dollar annual “energy tax” on electricity consumers and revitalizing the region’s antiquated coal- and oil-fired generators. Energy efficiency and renewables will help, but not to the extent New England needs to lower costs. Further, from a grid reliability standpoint, increasing intermittent energy from solar and wind will require additional pipeline capacity to ensure the region’s fleet of natural-gas-fired generators can ramp up to full output when the wind is not blowing and the sun is not shining, especially in the middle of winter. If the region finally wants to retire the remaining 8,300 MW of coal- and oil-fired generation, over 5,000 MW of generation must be constructed, some of which must be fueled with natural gas, and most of which should be located at or near the Hub to enhance grid reliability and have the greatest price-suppression effect.